Is Psycho II the most influential movie of the last thirty years? Probably not but consider this. In 1983, it was virtually inconceivable to attempt a sequel to an acknowledged classic without the participation or at least the approval of the original filmmaker. On the rare occasion it did happen, like with 1980’s High Noon, Part II, it was usually in the form of a made-for-TV movie. 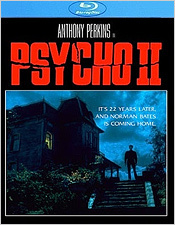 Indeed, Psycho II was originally destined to premiere on cable before unexpected interest in Anthony Perkins’ return to the role of Norman Bates persuaded Universal to make it a theatrical feature, albeit a low-budget one. Curiosity aside, almost no one thought a sequel to Psycho seemed like a good idea, only slightly less ill-advised than attempting a remake (but who’d ever be stupid enough to try that?). But a funny thing happened on the way back to the Bates Motel. Screenwriter Tom Holland and director Richard Franklin actually made a good movie. Not as good as Hitchcock’s original, of course, but much better than anybody expected. Certainly good enough to insure that studios would be a lot more interested in strip-mining their libraries for lucrative new-old franchises in the years to come. Thanks a lot, guys. Perkins is the movie’s not-so-secret weapon, clearly having a fine time revisiting his most famous character. After more than two decades in a mental institution, the state has found Norman Bates restored to sanity and ready to re-enter society as a productive citizen. Needless to say, this does not sit well with Lila Loomis (Vera Miles), the late Marion Crane’s sister. She’s been spearheading a victims’ rights campaign to keep Norman locked up for the rest of his life. But her petition is ignored and Norman goes home to a new job at a diner alongside waitress Meg Tilly and a seedier-than-ever Bates Motel, transformed into a no-tell motel by manager Dennis Franz. Norman seems OK at first, but when he starts getting notes and receiving phone calls from his dead mother, it’s only a matter of time before the bodies begin to pile up. Holland and Franklin found a neat way back into the Bates story, retaining one of the key elements from the original film: our sympathy for Norman. On some levels, we want him to be truly rehabilitated. Perkins balances things expertly, slipping back into Norman’s skin with ease. His performance is both drolly amusing and quietly creepy. Even in moments when it seems like he might be the good guy this time, Perkins gives Norman a disturbing physicality that reminds us that he could snap at any second. Franklin, a Hitchcock disciple who previously made the underrated Patrick and Road Games, is respectful of the original without necessarily mimicking it. If Psycho II makes a serious misstep, it’s in the final moments. The final scene is fun and it kind of works but it also hits the reset button and leaves the door wide open for future unnecessary sequels. Scream Factory’s Collector’s Edition release gives Psycho II a much-needed upgrade. The image quality is superb with rich inky shadows, a fine level of detail and a minimum of dirt and damage in the print. Audio is presented in your choice of DTS-HD 2.0 or a nicely done 5.1 remix that especially benefits Jerry Goldsmith’s score. Extras are mostly archival since Perkins and Franklin are no longer with us but they’re well worth a look. The vintage EPK material runs over half an hour and, while some of it is unavoidably repetitive, it does include some good interview material with Perkins, Franklin, Vera Miles, Janet Leigh, producer Hilton A. Green (who sadly just passed away last week), and others. There are also vintage audio interviews, presumably radio EPK material, that covers some but not all of the same ground. There are two trailers, four TV spots, a still gallery, and a new, very interesting audio commentary by screenwriter Holland in conversation with The Psycho Legacy director Rob Galluzzo. Psycho II is undoubtedly one of the least necessary movies ever made. Still, if someone was going to make a sequel to Psycho, I’m glad it was this one. It probably isn’t a coincidence that Universal itself wasn’t that interested in making this movie. This wasn’t a movie by committee, forced down the public’s throat by a studio looking for a surefire hit. It was a sequel made by people who genuinely loved the original and felt they’d struck upon a good way to continue the story. Fortunately for us and for the legacy of Mr. Hitchcock’s original, they were right.